I am now in that limbo time between posts. Having had a very full and moving farewell from Leverstock Green and the Benefice of Langelei, I now have a period where I am readying myself for ministry in the Parish of Mill End and Heronsgate with West Hyde. During that time, each day I will be praying for the 3 distinct communities ofg the parish using the collects for the patron saints of the churches: St. Peter, St John and St. Thomas Becket. 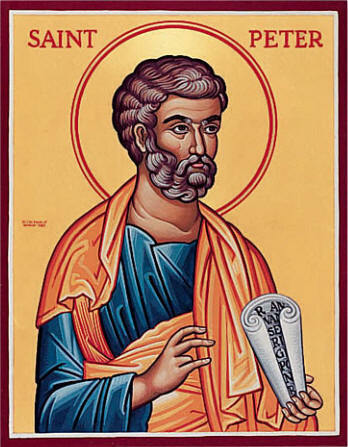 Peter has often been called the 'Prince of the Apostles' because of the words of Jesus re-naming him, from Simon to Cephas. This was the Aramaic form of the Greek word Peter, which means 'rock'. Jesus said that on this rock he would build his Church. Peter, after his proclamation of Jesus as Christ and Son of God, Peter spent the rest of his life and ministry witnessing to the Lordship of Christ. He was martyred in Rome in about the year 64. Whether or not John the Apostle and John the Evangelist are the same person we will never know but the Church honours the one who proclaims Jesus as the Word made flesh and who is 'the disciple whom Jesus loved'. John was one of the sons of Zebedee, along with James and Peter, who followed Jesus. John was there at the Transfiguration of Jesus on the holy mountain; he was there with Jesus at the last supper; he was there with Jesus in his agony in the garden; he was there with Jesus and his mother, standing at the foot of the cross; he was there with Jesus as a witness of his resurrection and 'he saw and believed'. John was a witness to the Word, he proclaimed the Word and he lived and died witnessing to the Word made flesh, Jesus Christ, who loved him and whom he loved. Thomas was born in London in 1118, of a family of merchants. After a good education he served as clerk to another burgess then entered the service of Archbishop Theobald of Canterbury. Thomas proved himself an excellent administrator and skilled diplomat. In 1155 he was appointed chancellor by King Henry II. For several years king and chancellor worked harmoniously together in mutual admiration and personal friendship. As a result, the king nominated Thomas as Archbishop of Canterbury to succeed Theobald in 1161. From the start there was friction, with Thomas insisting on every privilege of the Church. The conflict worsened until 1164 when Thomas fled to France. Encouraged by the Pope he continued his arguements with the King from there, sending letters and pronouncing excommunications. Three efforts at mediation failed before an apparent reconciliation brought him back triumphant to Canterbury in 1170. But the nobility still opposed him, and words of anger at court led four knights to journey to Canterbury where they finally chased Thomas into the cathedral, and murdered him on the steps of the altar on this day in 1170. Thomas was undoubtedly a proud and stubborn man, for all his gifts, and his personal austerities as archbishop were probably an attempt at self- discipline after years of ostentatious luxury. His conflict with King Henry stemmed from their equal personal ambitions, exacerbated by the increasingly international claims of the papacy, played out in the inevitable tension between Church and State.